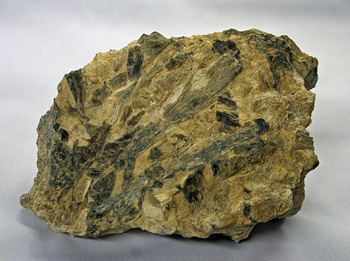 Sillimanite, also called fibrolite, is a mineral, aluminum silicate (Al2SiO5), found in mica schists and gneiss. Its crystals are of the orthorhombic system, usually fibrous masses, and are satin-like or glossy white, brown, green, or blue. A pale blue gem variety occurs in Sri Lanka. Hardness 6–7.5; relative density 3.2.